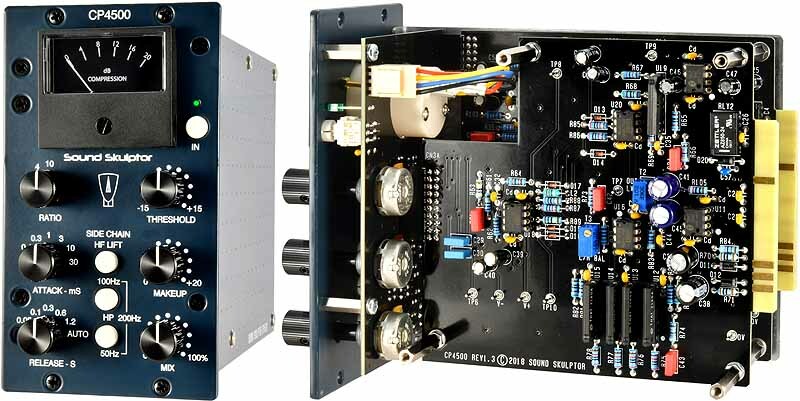 The CP4500 adds a few features to the original such as an equalizer in the side chain with three high-pass frequencies and a high boost section which enhances the spectral balance of the output. 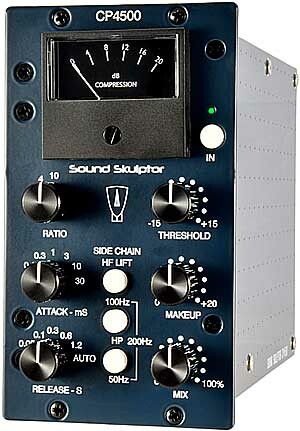 It also adds a Mix knob that allows mixing blending dry and wet signal for parallel compression. Available assembled or as a full kit (everything included). 1 RATIO Rotary switch that sets the compression ratio to 2, 4 or 10. 2 ATTACK Rotary switch that sets the attack time from 0.1 to 30 milliseconds. 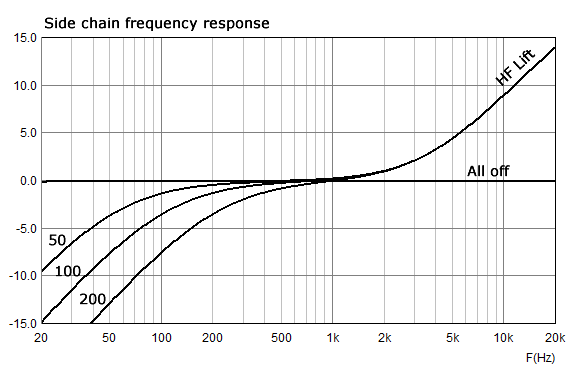 3 HP Inserts a 50, 100 or 200 Hz high-pass filter in the side-chain. Produces a Fat sound and eliminates bass driven pumping. 4 RELEASE Rotary switch that sets the release time from 0.05 to 1.2 second. The AUTO position is a program dependent automatic release time. 5 Meter Analog meter displays the dB gain reduction. 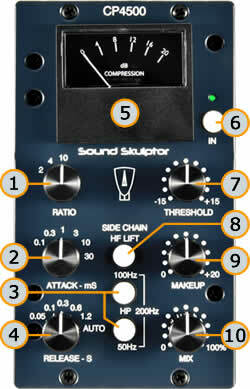 6 IN Compressor bypass (hardware by relay). 7 THRESHOLD Potentiometer that sets the input level at which compression begins. 8 HF LIFT Inserts a high boost filter in the side chain. Combined with the High-Pass it evens the audio energy in low and high bands and gives a very natural sounding to the compressed output. 9 MAKEUP Potentiometer that restores the signal level after being compressed (make up gain). 10 MIX Potentiometer that mixes the direct unprocessed signal with the compresses signal (0 to 100%) for parallel compression. The CP4500 kit is a medium difficulty kit. Nothing difficult but a rather large number of components. The setup is simple but requires using a good quality AC voltmeter. The XT500 option is a cable extension that allows you to setup the first channel of the module outside the lunchbox while connected. The trimmer tool is a screwdriver with a recessed head at one end which prevents it from sliding off the trimmer potentiometre head you are adjusting. Very convenient when you are working inside your lunchbox. Cant believe I got it right the fist time! No rework. No headaches. No freakouts. Well detailed build guide and a great sounding unit. While I've never used the OG SSL this bad boy definitely wins over the UAD emulations for me!